The Utah Arts Festival draws a crowd even in less than ideal weather conditions. When I arrived, the rain soaked tents were no deterrent for the crowds cheerfully exploring the events many offerings. Live music provided a pleasant background accompanied by the overwhelming and delicious smell of candied nuts. 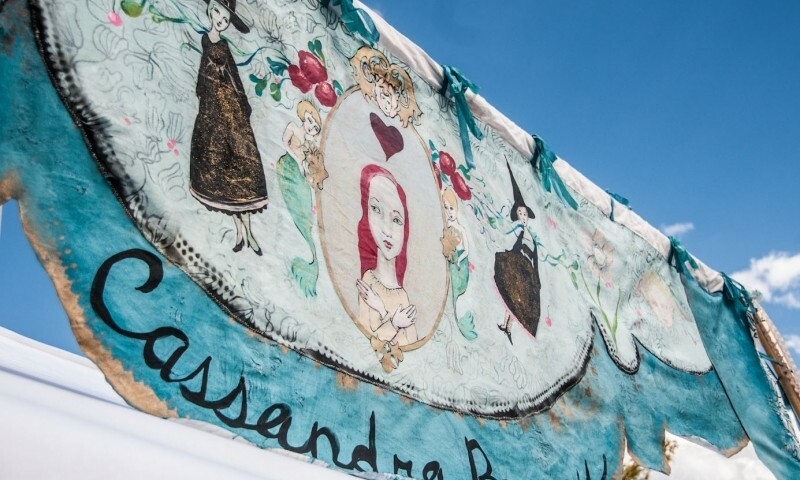 The Arts Festival is one of my favorites each year, and with so many people to meet and so many activities to do, I fully understand the difficulty in carefully planning a course to avoid missing out on any of it. Thursday, I started by wandering the first grouping of artist booths and keeping an eye out to build my Friday must-see list. 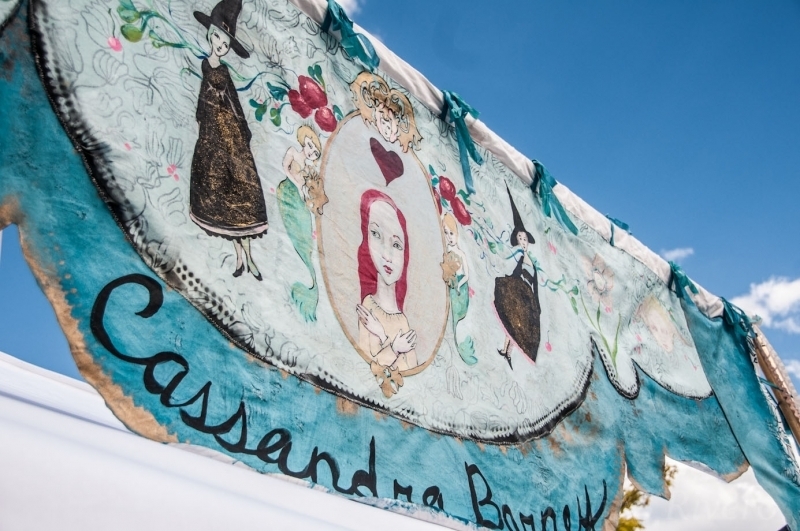 If anyone is looking for recommendations, Cassandra Barney is first up. In my opinion, everything looks better in oil paint. I haven’t however, seen such life and strength brought to works of art like the bright images by Barney. The women in her paintings provide a sense of strength and self-power, something she hopes to speak to her own three daughters. Simply from our brief encounter I would say that her paintings are saturated in her own vibrant and lovely personality. She shared a picture that she called “The Protector” and shared a story of discovering how fiercely protective she can be for her loved ones. She quickly added, “ Its my superhero name, I’ve decided, The Protector.” It may or may not have involved water balloons. For entertaining conversation and inspiring prints, a stop by her tent is a must. For the classical aficionado, Steve Duncan stands out as an artist whose stylization is on the brink of extinction. By being traditional in his form, Duncan’s gestural drawings seem oddly non-traditional when plated against the colorful pop art that decorated neighboring tents. His goal, he says, “Is to capture the human expression,” translating the emotions into “imaginary scenarios.” Using walnut-ink as his medium, the monochromatic images create beautifully dramatic scenes, dream like in composition. House of Tenebris is a husband and wife duo mastering the jewelry design and craft. They took on their business full time in November, sharing their appreciation of the light in darkness with the world. Adrian Prazen and Rachel Prazen’s jewelry depicts a variety of sacred geometry and esoteric designs etched into copper and brass to create their extravagant, wearable pieces of art. Using real gems and stones in their jewelry, in conjunction with the connectivity of copper, many of their pieces encourage the exploration of the occult. For those who crave the desire to embrace the darker side of beauty, stocking up on their wares is highly recommended. Bottoms Up Glass is hands down my pick of the day. I try not to play favorites, but the softness of Nikki Root’s work won me over instantly. Root’s pieces are created from recycled, and often vintage, glass. When I spoke with her she shared her passion for creating the beautiful glass panels, but also the deeply sentimental aspects of her work. “I’ve had many people come to me and ask me to use family pieces (for their panels). Every time there are tears,” She says, “ there are pieces that are passed on, and are normally so treasured that they’re kept away and never seen. My work allows them to be shown off and kept forever.” Her technique trumpets the eloquence of stained glass, and the emotion of human connectivity. The brilliance of color variety shone even on an otherwise overcast and gloomy day. The rain, if anything added to her pieces. While the weather worsened, my expectation for the festival has only increased. Many of the activities were put on hiatus due to the rain, but tomorrows forecast has me planning to attend as many as possible. As well as getting my grub on, a person can only handle so many smells before the stomach starts making all the decisions. Friday’s schedule includes the Indie Poetry Slam, performances by Australia’s Strange Fruit, and seven different programs for Fear No Film. More information can be found at the Utah Arts Festival’s website, http://uaf.org.